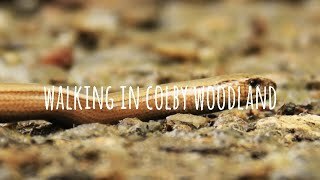 This walk explores Colby’s woodland garden and valley in Pembrokeshire, a haven for wildlife, walks, floral wows and heritage hunting. There’s something for everyone at Colby. This hidden wooded valley with its secret garden and industrial past is a place for natural play. There are fallen trees to climb, rope swings and playful surprises everywhere. The wildflower meadow is great for small explorers, with its meandering streams and habitat-rich ponds while the woodland trails lined with seasonal blooms offer a serene setting with year round interest. Look out for the large-leaved rhododendrons by the newt pond and old oak corner. The whole valley teems with wildlife – birds, butterflies, bats, frogs, toads, newts, water voles, even the occasional otter. Don’t forget your binoculars. The garden spans centuries and was once a working coalfield, it still hints at its past with capped off mine shafts and industrial remains dotted around the site. An old mine track is now the footpath that will lead you to the beach. On your return to the garden you’ll find a cosy tea room and a shop with plant sales and second-hand books. Picnics are welcome too.